1861 – 15th january (January 3 according to the Julien calendar),the birth of Vassili Vassiliévitch Andreev (Василий Василевич Андреев) in Béjetsk, the main town in the district of the province of Tver. His father a wealthy merchant, his mother a noble, cultivated. She speaks several languages, has a pretty voice and plays the piano well. 1883 - Death of father. He moves to Márino, to the summer datcha. Vassili begins to learn the piano with his mother and the garmochka alone, imitating the play of his coachman. He is schooled by tutors. 1872 - Remarriage of his mother with Nil Nicolaïévitch Seslavine, an engineer. 1875 - "At 14 years of age, I played twelve instruments, without knowing a single note". He knows how to sing numerous popular songs and dance the prissiádka (a typical Russian dance) with the mujiks. 1882 - End of all studies. Trip to Europe. In Italy, he hears orchestras of mandolines and guitars. He starts to take an interest in the history of Russian instruments and decides to become a musician. 1883 - In June, on returning to Márino, he hears the balalaika played for the first time and emulates the way that Antipe, his farm labourer plays. Then he refines his playing technique, thanks to a neighbor, A. Paskine, an amateur-virtuoso, who also helps him to find Antonov, a wood-worker, to craft a balalaïka for him. He plays it, solo, during an amateur performance at the Annaïev family home in Samara. I Mouraviov, another wood-worker, builds him an even better one, although still diatonique and with 5 frets. 1886 - Still dissatisfied, the young Andreev orders a more sophisticated balalaika to be made by V Ivanov, a St. Petersburg violin maker and with which he will play three concerts in St-Pétersburg, accompanied by lawyer P. Savéliov at the piano. The press describe him as a "new sensation". 1887 - Andreev plays before tsar Alexandre III and the Court. On March 1st, the violin maker F Passerbski proposes to work with him. Very soon a chromatic balalaika comes to light with 12 frets and according to the plans of the "Father of the balalaïka", the family: soprano or PRIMA, tenor or secunda, bass, piccolo or diskant, and finally, double bass. On June 15th, release of the first technique, and in October, the staging of the "Circle of amateur balalaika players", which includes 9 musicians; courses begin in December, with 14 pupils. 1888 - Sunday March 20th, historical date of the first concert of the "Circle"; the press acknowledging unanimously the enthusiasm of the audience which calls for an encore after each piece. Tour of Russia. F Chaliapine sings accompanied by the "Circle" in Nijni-Novgorod. 1889 - Small tour of Riga, Vilnius and Warsaw; preparation of the first international tour which will last the month of September in Paris, coinciding with the World Fair. Andreev is awarded the Legion of honour. A huge effect is had within Parisian artistic circles and similarly, on the elite of St.Petersburg during the return of the small ensemble to the Russian capital, particularly during an evening at the home of sponsor, M.Béliaïev, where the guests present include Glazounov, Rimski-Korsakov, Liadov, Stassov, Tchaïkovski. The latter exclaiming at the end of the concert: “ these balalaikas are a delight! What an astonishing effect they have on an orchestra! Their tone is unrivalled." 1890 – September 10th, meeting with S. Nalimov, a gifted wood-worker, who under Andreev`s directive will build approximately 170 balalaïkas over a period of 20 years, as well as 150 other instruments in Márino. Concert tour of Russia. 1891 - 5 concerts in St-Pétersburg. Second tour of Russia; in Tiflis (Tbilissi), Anton Rubinstein says to Andreev: "I am very surprised. I would never have expected that of the balalaïkas. The effects which you can draw from them are astonishing. It is already so difficult to create originality in the musical field. I compliment and honour you, Vassili Vassiliévitch, you have brought a new element to music." Start of free courses given to the conscripted soldiers, thanks to which the balalaïka and the playing of it rapidly spreads (600 soldiers in 6 years). 1892 - 5 concerts at St-Pétersburg. Second tour of France. The "Circle" is invited to Paris by the "Figaro". 15 concerts and a tour of Cherbourg, Le Havre, Rouen and Trouville achieve sharp success with audiences and French musicians such as C.Saint-Saëns, B.Godard, R.Pugnot, J.Massenet. J.Massenet writes: "I listened with enormous interest to the" Circle of the Russian balalaïkists "and I was fascinated by their talent and the musical effects which they know how to produce on their colourful instruments". Andreev is received by the French Academy, a section of the Beaux-Arts and receives the Palmes Academiques for "the introduction of a new element in Music". A balalaïka class is opened at the Paris Academy. As of this tour, Andreev stops playing as a balalaika and garmochka soloist and prefers instead to conduct. The following years are assigned to teaching soldiers, writing orchestrations, techniques and articles; performing (21 concerts in 2 years) and to helping the founders of other orchestras of the same genre, consolidating the connections with S. Nalimov, N Fomine, V Nassonov, F Nimane, N Privalov, P. Karkine, etc, and also with I Répine, Mr. Gorki, and all the artistic and cultural elite of his time, not only in Russia but elsewhere in the world. 1896 - start of the remodelling of the domra. It is included in the family of the "Circle", renamed "Great-Russian Orchestra", which is now made up of 16 musicians. The gousli "psaltyr'" is also introduced. 30 newspaper articles, clarify the choice of instruments and their improvements and inform the Russians about their national instruments, and of the important role that they have to restore and bring life to this Russian folk treasure. In spite of that, Andreev encounters an unfavourable prejudice against these instruments coming from several musical critics. He has to seek the approval of eminent figures who will give him their moral support, such as L Tolstoï: "... I believe that what you are doing is a good deed, trying to ingrain these old and charming songs within the people. I think that you will achieve the goal that you have chosen and, for that, I wish your cause succéss!". Collaboration with the Zimmermann company which will produce many instruments, especially abroad after the revolution. 1897 - courses held in the garrisons are finally paid for by the government under the title of "Organisation of musical instructors of the army". The briolka, the double svirel' join the Orchestra. The goudok, although much improved by Fomine, is not included. 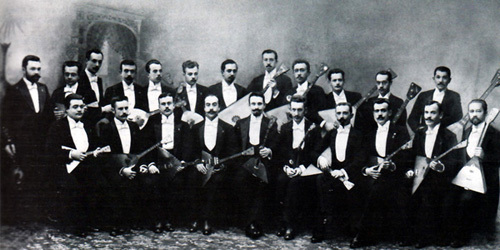 1898 - As of this year the following instruments are introduced into the Orchestra: domras, both bass and piccolo (domrichko), gousli "on feet" (played by V.Danilov), nakry, boubèn and lojki. In March, jubilee concert to celebrate 10 years of the "Andreevian orchestre". For this occasion, an orchestra of 300 musicians (!) is directed by Andreev. 21 concerts follow in the same year. The critic A. Ossovski writes: "In St-Pétersburg alone, nearly 20 000 balalaika players are counted". On April 18th, Andreev is decorated with the order of St-Stanislas and he is allocated a life pension by the Tsar Nicolas II. 1899 - First recording of the Great-Russian Orchestra, conducted by its founder. Publication of his article "National instruments of Russia" in both French and English. 1900 - Third tour of France financed by the Tsar. 25 concerts in 6 weeks. On June 14th, Andeev receives the Great Cross of the Legion of honour and the Gold Medal of the World Fair of Paris. The Orchestra plays in front of French President E Loubet. 1901 - 20 concerts in Russia. From now on the complete family of domras play in the Orchestra. 1902 - 13 concerts. Opening of "free Classes for the study of traditional Russian instruments" at the House of the People in St-Pétersburg. Andreev helps N Kondratiev and his rojétchniki to make a record. 1903 - 18 concerts. Fomine adapts up to 350 works of Glinka and Tchaïkovski; of the Group of 5 and of Rubinstein, but also those of Mozart, Schumann, Schubert, Bizet, etc and thus enlarges the repertoire. 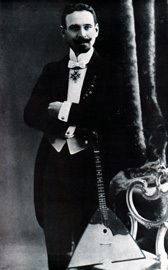 1904 - Boris Troïanovski arrives as soloist in the Orchestra for a seven year period. Concert - Demonstration introducing the complete Great-Russian Orchestra as a symphony orchestra performing the Scherzo (pizzicato ostinato) from Tchaïkovski`s 4th symphony, reorchestrated by Fomine and directed by A.Nikisch. The press unanimously acknowledges its success and the respect and approval accorded by the personalities present: A.Siloti, E.Ysaÿe, N.Soloviev, etc. The famous dancer, Mr. Fokine, a future collaborator of the domrist S.Diaghilev and part of the orchestra for 10 years, will play on this special occasion. 1905 - Intense manufacture of instruments; V Katanski will sell 9000 in the Ukraine between 1905 and 1907! The Andreevians assiduously work upon and rehearse a new repertoire. 1906 - Considerable success for the first execution of “Russian Fantasy” in the presence of the author A. Glazounov written for the Great Russian Orchestra and conducted by its chef. N Tchérépnine composes the "Boys Dance" for xylophone and Orchestra. N Privalov composes a "Polianka" played by 250 soldiers and conducted by Andreev. 1907 - Organisation of two orchestras: the first playing in the capital, the second, made up of selected soldiers, touring with its chef in Russia. Concerts for the benefit of the disabled, widows and orphans of the Russo-Japanese war. Andreev is named College Assessor and is decorated with the Order of St-Anne. The Duma awards him 10.000 roubles for his tours and for the wages of his musicians. The cost of nalimovian instruments increases: 300 roubles for a PRIMA balalaika! Nalimov receives the Gold Medal at the First Pan-Russian Exhibition of musical instruments. Rimski-Korsakov mistakenly includes an orchestra of balalaïkas and domras in his opera "the legend of the invisible city of Kitèje" and withdraws it during a run through: "... right from the start, I didn`t really know how to go about things in the right way. May my example be useful and informative to other composors ". 1908 – Numerous newspaper interviews for the 20 year commemoration of artistic activity. 20 000 instruments are manufactured each year. First tour of Germany (23 concerts with 28 musicians). Meetings with R. Leoncavallo, A. Nikisch, K Mück and K Sachs, all very impressed by the Great-Russian Orchestra. Formation of numerous Russian orchestras in Germany, including in the garrisons. 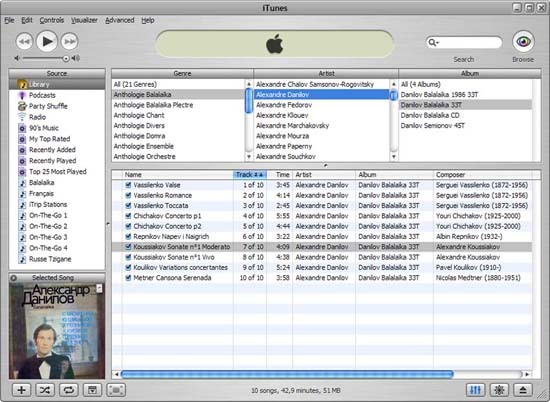 Introduction of the "gousli with keyboard", fine-tuned and played by A. Herhens. 1909 - Concerts In Moscow. The Orchestra plays in front of Russian celebrities: L.Tolstoï, C.Stanislavski, I.Némirovitch-Dantchenko, M.Ippolitov-Ivanov. The latter will later become the author of a Concerto for balalaïka and symphony orchestra. First tour of England (192 concerts). Triumph at the London Coliseum. The 3 week contract is extended to 3 months. The 28 musicians of the Orchestra play in front of King Edward VII, in Windsor. On return to Russia, the State allocates them an annual subsidy of 35 000 roubles. 1910 - Tours of Russia (13 concerts), Germany, England (August 1st - September 30th), France, thanks to the invitation of Sarah Bernhardt (1st – 7th October ), England again (1st – 7th November ), then North America (November 28th - February 16th, 1911). The New York Times Writes: "the Russian orchestra is an outstanding event of our time. Only a genius could create such a perfect musical ensemble from such primitive instruments ". While these tours are in progress, a few instructors, A. Tchagadaïev, F Rennike, V Pogoreloff, will remain behind to organise Russian orchestras and to give courses. 1911 - 1 month tour becomes a 3 month tour (from October 9th to December 15th) with 100 concerts in the largest cities of the USA. A. Toscanini, after having heard and appreciated the waltz composed by Andreev, baptises him the "Russian Strauss". Americans playing mandolines, guitars or banjos prefer to join the Russian orchestras and start to play the balalaïka and domra following the example of L Spindler, a shoe-maker in Saint-Louis and pioneer of the orchestras in the US. 4th tour of England (from 1st -15th March) Return to Russia, where N Ossipov,10 years old, begins his solo career with the Orchestra. Concerts In Warsaw. Second tour of America then Canada (October 9th - December 15th). A. Dobrokhotov and A. Zaroubine are the balalaïka soloists. In Moscow, N Plévitskaïa, mezzo-soprano, sings his popular Russian songs solo, accompanied by Andreev`s now very famous Orchestra. 1912 - Fifth tour of England (60 cities from 1st -15th January); end of the international tours. Large tours of Russia (60 cities) by rail, the carriages loaned by the Ministry. A. Dobrokhotov, N Ossipov and A. Zaroubine, are the soloists. The latter gives balalaika courses to Tsarévitch Alexis Nicolaïévitch Romanov and certain dignitaries of the Court! Release of a recording of the Orchestra. 1913 - Introduction of the "gousli tones" improved by Andreev, Nalimov and D. Minaïev; making of a third record, on the 2nd of August, at the Marie Theatre. Concert commemorating the 25th anniversary with 85 musicians. Gifts, letters and telegrams of congratulations coming from the world over are addressed to Andreev who is named Court Advisor. Triumphal tour of 20 Russian cities. Nalimov manufactures 5 four-string domras. 1914 - Andreev is named "Soloist of His Imperial Majesty" and the Orchestra, "The Great Russian Imperial Orchestra". The Duma allocates Andreev a subsidy of 25 000 roubles per year. Many ensembles and orchestras are created following the example of the Orchestra (soldiers, schoolboys, students, workmen, etc). Start of the German-Russian war. Many soloists play on the stage in concerts and on the front line. 1915 - Andreev creates the "Company for the development of the study of Russian popular instruments and chorale". Concerts in Moscow during which the famous opera singers A. Néjdanova, E Stépanova, L Sobinov, E Heltser, etc are introduced, accompanied by the Orchestra. 1917 - March 7, the revolutionary Duma renames the Great Russian Orchestra the "Original Great Russian Popular Orchestra" and links it to the Red Army. A. Lounatcharski sends it to the North-eastern front, after a last concert given at the Cinizelli Circus. 1918 – Andreev holds his position in Marino and during a concert in front of the soldiers, declares: "I am totally satisfied with the results of these many years work. I’ve worked for the Russian people. I took its primitive and forgotten instruments and returned them in the beautiful state that you see here! All this, Andreev adds, indicating his orchestra, belongs to you, the people, use it wisely!". During this tour, where harsh conditions prevail, Andreev, exhausted, falls sick and is confined to bed in a non-heated coach for 20 days. Repatriated to Pétrogad where he spends a month in hospital, he calls for Fomine and Karkine to give them his last wishes and dies of pneumonia during the night of the 25th/26th December 1918. Vassili Vassiliévitch Andreev is buried in national funeral in the Necropolis of Laure d' Alexandre Nevski in St-Pétersburg beside the great Russian composors, Glinka, Borodine, Moussorgsky, Rimski-Korsakov, Tchaïkovsky. "I do not want to be placed in the ranks of professional music artists. My life has been as hard as it has been serious and artists often live too much for the moment. I always looked towards the future rather than at the present, towards the day when the balalaïka would be a universal instrument, known and loved in every country." 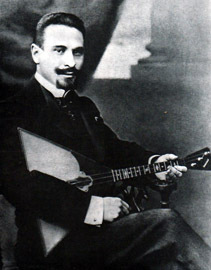 A testimony of Vassili Andreev playing balalaika in 1899 in one of his compositions, it is probably the first recording of balalaika in history.